This article is about the Dire Straits song. For the greatest hits album, see Sultans of Swing: The Very Best of Dire Straits. The demo of the song was recorded at Pathway Studios, North London, in July 1977 and quickly acquired a following after it was put on rotation at Radio London. Its popularity soon reached record executives, and Dire Straits were offered a contract with Phonogram Records. The song was then re-recorded in February 1978 at Basing Street Studios for the band's debut album. The record company wanted a less-polished rock sound for the radio, so an alternative version was recorded at Pathway Studios in April 1978 and released as the single in some countries including the United Kingdom and Germany. The music for "Sultans of Swing" was composed by Mark Knopfler on a National Steel guitar in an open tuning, though Knopfler did not think very highly of it at first. As he remembered, "I thought it was dull, but as soon as I bought my first Strat in 1977, the whole thing changed, though the lyrics remained the same. It just came alive as soon as I played it on that ’61 Strat which remained my main guitar for many years and was basically the only thing I played on the first album and the new chord changes just presented themselves and fell into place." Inspiration for the song came from witnessing a jazz band playing in the corner of a practically deserted pub in Deptford, South London. At the end of their performance, the lead singer announced that they were the "Sultans of Swing", and Knopfler found the contrast between the group's dowdy appearance and surroundings and their grandiose name amusing. Folk singer and Columbia recording artist Bill Wilson (1947–1993) claimed to have co-written the song. Wilson did not get a songwriting credit on the release, but claimed to have received some monetary compensation for his input. According to the sheet music published at Musicnotes.com by Sony/ATV Music Publishing, the song is set in the time signature of common time, with a tempo of 149 beats per minute. It is composed in the key of D minor with Knopfler's vocal range spanning from G2 to D4. The song has a basic sequence of Dm–C–B♭–A as its chord progression for the verses, and F–C–B♭ for the choruses. The song's riff makes use of triads, particularly second inversions. The song employs the Andalusian cadence or diatonic phrygian tetrachord. All of the chords are compatible with a D natural minor scale, except for the A major triad, which suggests a D harmonic minor scale. Knopfler would later use similar triads on "Lady Writer". Shortly after the band formed in 1977, a musician flatmate of drummer Pick Withers having given the team the name "Dire Straits", they recorded a five-song demo tape at Pathway Studios, which included "Sultans of Swing" in addition to "Water of Love", "Down to the Waterline", "Wild West End", and David Knopfler's "Sacred Loving". They took the tape to influential DJ Charlie Gillett, who had a radio show called Honky Tonk on BBC Radio London. The band simply wanted advice, but Gillett liked the music and put "Sultans of Swing" on his rotation. Two months later, Dire Straits signed a recording contract with Phonogram Records. 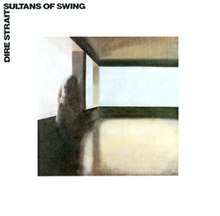 "Sultans of Swing" was then re-recorded in February 1978 at Basing Street Studios for the band's debut album Dire Straits. It was produced by Steve Winwood's brother Muff Winwood. Knopfler used the guitar technique of finger picking on the recording. Ken Tucker of Rolling Stone singled out "Sultans of Swing" as a highlight of the album for its "inescapable hook" and compared Knopfler's vocal stylings to that of Bob Dylan. The New Rolling Stone Album Guide called the song "an insinuating bit of bar-band mythmaking" whose lyrics "paint a vivid picture of an overlooked and underappreciated pub combo". The Spokane Chronicle's Jim Kershner wrote that "Sultans of Swing" is "remarkable, both for its lyrics that made fun of hip young Londoners and the phenomenal guitar sound of Knopfler", which "sounded like no other guitar on radio". Jon Marlowe of The Palm Beach Post called it "an infectious, sounds-damn-good-on-the-car-radio ode to every bar band who has ever done four sets a night, seven nights a week". With "Sultans of Swing" a breath of fresh air was exhaled into the airwaves in the late ’70s. Sure, Donald Fagen and Tom Waits were writing great lyrics about characters you’d love to meet and Jeff Beck and Eddie Van Halen were great guitar players. But Knopfler, he could do both things as well or better than anybody out there in his own way, and didn’t seem to have any obvious rock influences unless you try to include Dylan. Like his contemporary and future duet partner Sting, Knopfler’s ideas were intellectually and musically stimulating, but were also accessible to the average listener. It was almost like jazz for the layman. "Sultans of Swing" was a lesson in prosody and tasty guitar playing that has seldom been equaled since. If you aren’t familiar with "Sultans of Swing" or haven’t listened to it in a while, you should definitely check it out. Record Mirror ranked "Sultans of Swing" tenth in its end-of-year countdown of the best songs of the year. In 1992, Life named it one of the top five songs of 1979. In 1993, Paul Williams included it in his book, Rock and Roll: The 100 Best Singles. The song is on The Rock and Roll Hall of Fame's 500 Songs that Shaped Rock and Roll list, Dire Straits' only appearance. In 2006, Mojo included it in a list of the 50 best British songs. Guitar World ranked its guitar solo at No. 22 of the greatest, and Rolling Stone named it the 32nd greatest guitar song. The song was originally released in May 1978, but it did not chart at the time. Following its re-issue in January 1979, the song entered the American music pop chart. Unusually, the success of this single release came more than six months after the relatively unheralded release of the band's debut album in October 1978. BBC Radio was initially unwilling to play the song due to its high lyrical content but after it became a U.S. hit, their line softened. The song reached the top 10 in both the UK and the U.S., reaching No. 8 on the UK Singles Chart and No. 4 on the Billboard Hot 100 and helped drive sales of the album, which also became a hit. "Sultans of Swing" was re-issued again as a single in November 1988, a month after it appeared on the band's greatest hits album Money for Nothing, when it peaked at No. 62. It was also included on Sultans of Swing: The Very Best of Dire Straits and The Best of Dire Straits & Mark Knopfler: Private Investigations. Knopfler has improvised and expanded that solo during live performances. The coda of the live recording on the 1984 album Alchemy stretches the song to nearly 11 minutes. Another live version of the song came at the 1988 Nelson Mandela 70th Birthday Tribute concert in London when Eric Clapton teamed up with the band to play the song, providing rhythm guitar. ^ All Music Guide: The Definitive Guide to Popular Music (4th ed.). Hal Leonard Corporation. 2001. p. 120. ISBN 0879309237. ^ a b "100 Greatest Guitar Solos: No. 22 "Sultans of Swing" (Mark Knopfler)". Guitar World. 21 October 2008. Retrieved 22 March 2014. ^ "Song Stories - "Sultans of Swing"". Rolling Stone. Retrieved 16 April 2014. ^ a b Fish, George. "Say Good-bye to a legend" (PDF). December 8–16, 1993. Nuvo.net. Retrieved 27 July 2016 – via Stringdancer.com. ^ a b Nichols, Rob. "Bill Wilson's back | Local Music Profiles | NUVO News | Indianapolis, IN". Nuvo.net. Retrieved 27 July 2016. ^ "Digital Sheet Music – Dire Straits – Sultans of Swing". Musicnotes.com. Sony/ATV Music Publishing. ^ "Spinning on Air". WNYC.org. All of the chords are compatible with a D natural minor scale, except for the A major triad which suggests a D harmonic minor scale. ^ "On Every Street" official tour programme. ^ Tucker, Ken (25 January 1979). "Dire Straits". Rolling Stone. Retrieved 4 December 2012. ^ Kershner, Jim (3 April 1992). "Dire Straits: Tour Provides A Great Opportunity to See a Great Band". Spokane Chronicle. Retrieved 17 April 2014. ^ Marlowe, Jon (26 November 1980). "Dire Straits 'Making Movies' Stcks to a Reality That Really Sticks to Your Heart". The Palm Beach Post. Retrieved 17 April 2014. ^ Moore, Rick (7 January 2013). "Dire Straits - "Sultans of Swing"". American Songwriter. Retrieved 24 May 2014. ^ "Record Mirror End of Year Lists". Rock List Music. Retrieved 17 April 2014. ^ "Life". Rock List Music. Retrieved 17 April 2014. ^ "Experience The Music: One Hit Wonders and The Songs That Shaped Rock and Roll". Rock & Roll Hall of Fame. Archived from the original on 28 June 2011. Retrieved 30 March 2011. ^ "Mojo". Rock List Music. Retrieved 17 April 2014. ^ "Music News: Latest and Breaking Music News". Rolling Stone. Retrieved 22 March 2014. ^ "Humble guitar hero in Istanbul tonight". Hürriyet Daily News and Economic Review. Retrieved 7 October 2009. ^ Ruhlmann, William. "Alchemy: Dire Straits Live Review". Allmusic. Rovi Corporation. Retrieved 26 May 2014. ^ Dougherty, Margot (27 June 1988). "South African Freedomfest". People. Retrieved 24 May 2014. ^ "Sultans of swing in Belgian Chart". Ultratop and Hung Medien. Retrieved 13 June 2013. ^ "Sultans of swing in Canadian Adult Contemporary Chart". Library and Archives Canada. Retrieved 13 June 2013. ^ "Sultans of swing in Canadian Top Singles Chart". Library and Archives Canada. Retrieved 13 June 2013. ^ "Sultans of swing in German Chart". Media control. Retrieved 13 June 2013. ^ "Sultans of swing in Irish Chart". IRMA. Retrieved 13 June 2013. Only one result when searching "Sultans of swing"
^ "Sultans of swing in Netherlands Chart". Nederlandse Top 40. Retrieved 13 June 2013. ^ Hung Medien. "Sultans of swing in New Zealand Chart". Retrieved 13 June 2013. ^ John Samson. "Sultans of swing in South African Chart". Retrieved 13 June 2013. ^ "Dire Straits". Official Charts Company. Retrieved 13 June 2013. ^ "Dire Straits awards on Allmusic". Allmusic. Retrieved 13 June 2013. ^ "Canadian single certifications – Dire Straits – Sultans of Swing". Music Canada. Retrieved 3 October 2016. ^ "Italian single certifications – Dire Straits – Sultans of Swing" (in Italian). Federazione Industria Musicale Italiana. Retrieved 3 October 2016. Select "Tutti gli anni" in the "Anno" drop-down menu. Select "Sultans of Swing" in the "Filtra" field. Select "Singoli online" under "Sezione". ^ "British single certifications – Dire Straits – Sultans of Swing". British Phonographic Industry. Retrieved 3 October 2016. Select singles in the Format field. Select Gold in the Certification field. Type Sultans of Swing in the "Search BPI Awards" field and then press Enter. Nathan Brackett, ed. (2004). The New Rolling Stone Album Guide. Simon and Schuster. ISBN 0743201698. Williams, Paul (1993). Rock and Roll: The 100 Best Singles. Entwhistle Books. ISBN 0934558361.